We've edited this original post to show the most up to date version of this sling project. It's based on our Accelerator Sling and uses the same collapsing loop design but with a different adjustment mechanism. 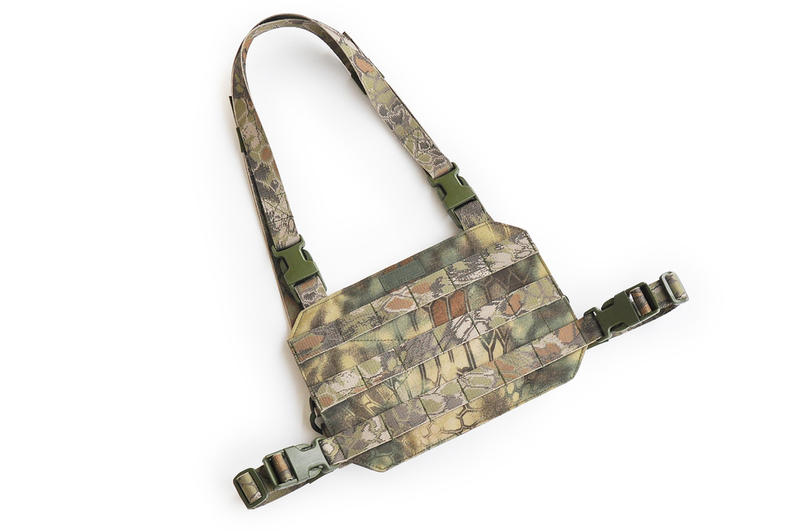 Instead of using a single buckle this one uses a dual buckle system, to create an optimal webbing path. 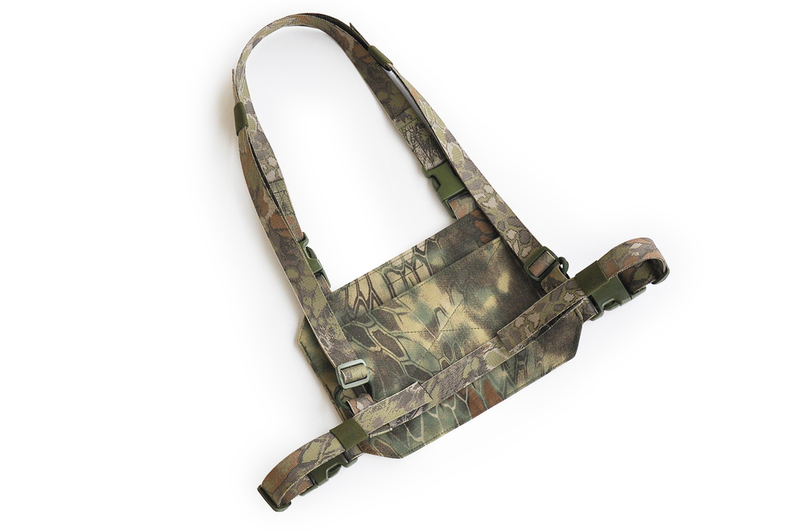 It does not require any sort of pull tab to operate; simply slide the buckles to the desired position and that's it. Like other designs on the market it uses friction created by weaving the webbing through the buckles, the difference is that because two buckles are used instead of one, they "loosen" and slide more freely when adjusted, making it very fast and smooth. 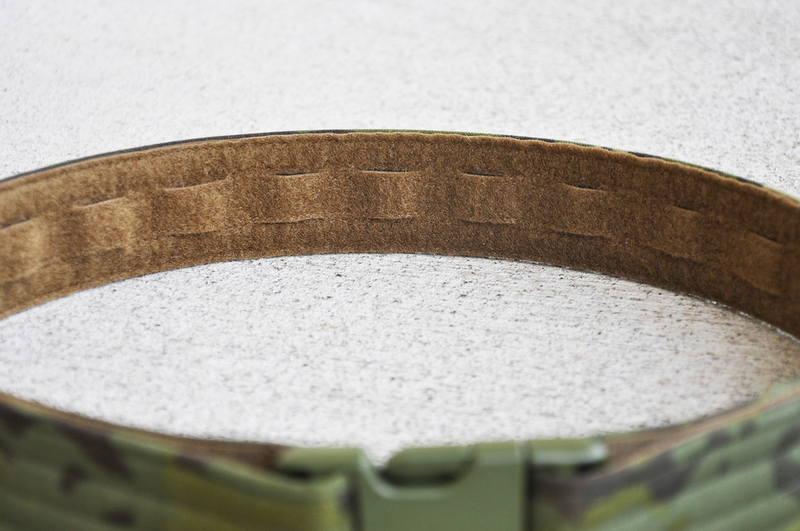 The prototype pictured below is in MultiCam and uses ITW hardware. It weighs only 80g or 2.8oz! This is a custom product we've been developing. The one pictured here was made by request from one of our customers. The base panel is designed to plug into many aftermarket armour systems that feature vertical QASM buckles on the front. Most of these systems have loop Velcro as well, so we've added 4" x 8" Velcro Hook with a cover. The panel can also be used as a stand-alone rig by adding the unique light weight harness. 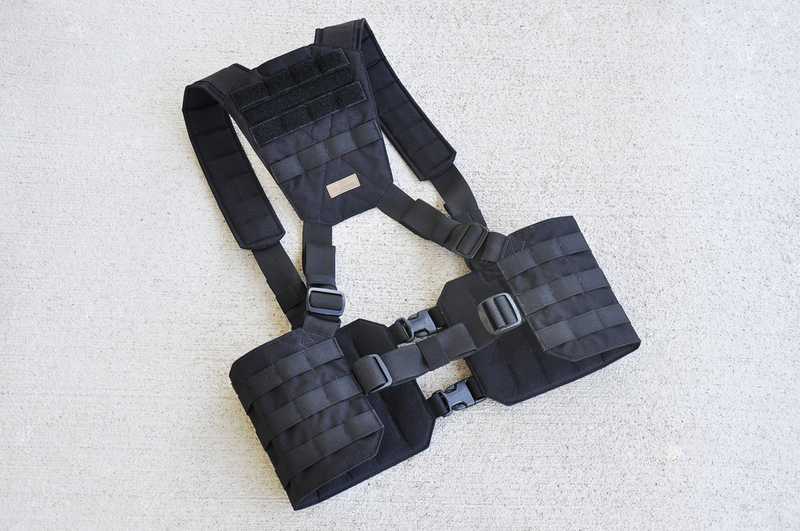 Unlike traditional chest rig harnesses, the shoulder straps attach directly to the waist strap. It is fully adjustable for height and girth and allows the user to control the ride height of the panel. The rig is designed to be worn low, around the waist but is also fully adjustable for height and girth. Total weight as pictured is 500g or 1.10lbs, making it quite light for it's size and the amount of equipment it can carry. We've got some pictures of a prototype rifle mag pouch that is being tested. The concept is a mag pouch that will accommodate many different rifle mags, from 5.56mm to 7.62 NATO, without unnecessary bulk or an overly complicated design. The prototype pictured consists of a one piece, semi-rigid, main body and two integrated elastic webbing sides. This allow the pouch to expand and contract, securing the contents, regardless of their shape or size. The interior is also completely snag-free. If empty, the pouch can be flattened down to minimize it's size. The user can re-insert objects without having to use two hands to pry open the top. By nature of the design, the pouch has a small opening at the bottom that allows drainage and clearing of any debris. This particular prototype also features a unique low-profile attachment system that is incredibly easy to use and adds almost no weight to the design.